Ocean Park is a resort (balneario) in the Maldonado Department of Uruguay. 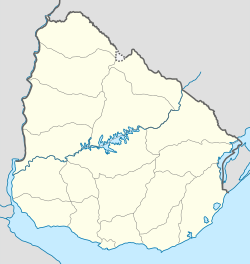 The resort is located on the coast of Río de la Plata, about 6 kilometres (3.7 mi) west of Punta Ballena and 7 kilometres (4.3 mi) (by road) east of the resort Punta Negra. It borders the resort Sauce de Portezuelo to the west and to the resort Chihuahua to the east, with the stream Arroyo del Portero separating it with the latter. It north limit is the Ruta Interbalnearia, also marked as Route 93 for this area, and across it are the town La Capuera and the Capitán de Corbeta Carlos A. Curbelo International Airport, both of which are on the coast of Laguna del Sauce. In 2011 Ocean Park had a population of 234 permanent inhabitants and 280 dwellings. ^ "Censos 2011 Maldonado (needs flash plugin)". INE. 2012. Retrieved 29 August 2012. ^ "1963–1996 Statistics / O" (DOC). Instituto Nacional de Estadística de Uruguay. 2004. Retrieved 28 July 2011. This article about a place in Maldonado Department is a stub. You can help Wikipedia by expanding it. This page was last edited on 2 December 2018, at 20:30 (UTC).